Spout is a real time video sharing framework for Windows. Spout is more or less the equivalent of Syphon on OS X (GeeXLab has a built-in support of Syphon). Some applications are Spout senders and other are Spout receivers (and some can be both at the same time). 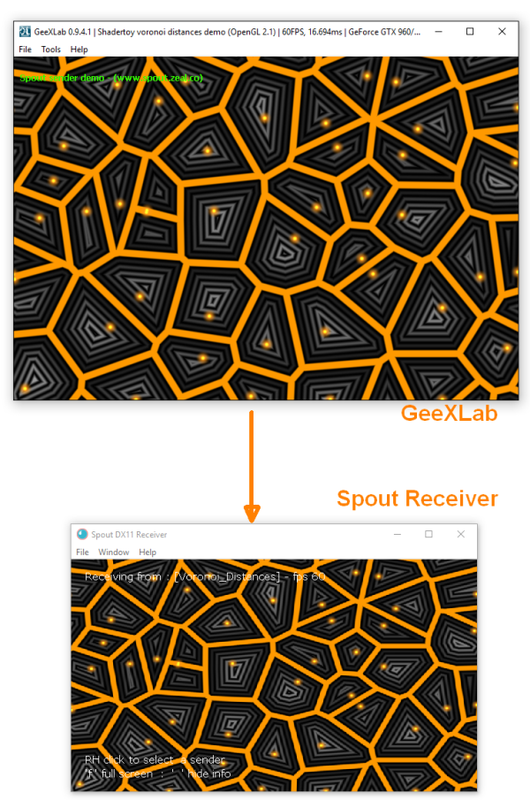 A Spout sender application generates an image (from a video or from a real time 3D scene with shaders for example) and sends this image to any Spout receiver application (like the VJ tool Resolume). 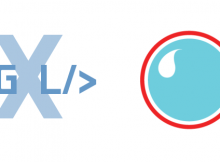 Lynn ‘leadedge’ Jarvis, the author of Spout, sent us (HERE on the forums) a user plugin that transforms any GeeXLab demo in a Spout sender (minor changes are required in each demo to load the plugin and call the related functions). More information about GeeXLab and user plugins in C/C++ can be found in THIS THREAD. The Spout sender project is available on Github. Lynn also provided a ready-to-use-with-geexlab demo with a 64-bit spout sender plugin. I added the demo as well as the plugin in the code sample pack in the host_api/Spout_Sender/ folder. You can find the SpoutReceiver.exe demonstration program in the DEMO/ folder of the Spout2 project.